PegsPlace doesn't have any items in their booth! She is a great friend, through and through. Honest, friendly and very helpful. She helped me a lot with my old booth. I am grateful for all the help she’s given to me and the kindness she has shown. What is left to say…..I have never seen so many endorsement on one person. That alone say what a great gal she is..I am glad I have met her and can be a bonanzle buddy to her. Peg is a genuine asset to Bonanzle and to me…she has gone above and beyond to help me…I can go to her anytime and she will assist me in anything I need her for..a true friend that I am honored to be associated with..
Peg is an asset to Bonanzle. She has continually given her time to help others, host games, and support animal rescue. I would definately reccomend this seller as her Integrity and constant contributions to this community are of the highest nature and very much appreciated. Such a sweet and wonderful person. More people should be just like you! Best wishes for everything you do! Peg is a great Bonanzler! She is very helpful to many people! She has a banner making addiction, which of course we all benefit from. And what a wonderful job she does. Thank you so much!!!! Peg is a terrific, generous and talented person. She goes out of her way to help. She’s a credit to the Bonanzle community. .
Peg is a Wonderful Seller & Buyer on Bonanzle and a tireless and kind person to do business with. So very helpful, I highly recommend! This is truly a wonderful person who works tirelessly to help homeless kittens and cats. She’s an awesome seller and a wonderful communicator. I have been truly blessed to have gotten the opportunity to meet and get to know this amazing woman. I look forward to doing business with her and building a friendship that will last a long time. I give her all my prayers and wish her luck in her continuing battle to help these poor, defenseless kittens. She’s a true inspiration to us all. God Bless Peg! I am comforted to know that with each Friday, Peg will visit my booth and say â€œHelloâ€. Always a warm gesture on Pegâ€™s behalf and one I truly welcome. Recently, I had the opportunity to return the favor and take the time to browse Pegâ€™s booth. I saw an item in her booth that struck my attention and I wasnâ€™t sure if it was for sale or donation to Peg for her endless hours of work to rescue kittens. I inquired about the item and luckily for me it was for sale. I purchased the item and couldnâ€™t be happier. Peg provided me with top-notch service from beginning to end; from Sales, Pricing, Packaging and an extremely Fast Shipment. 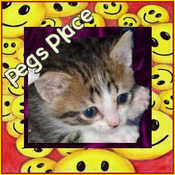 Peg is a uniquely kind individual who devotes her proceeds and time to rescue kittens. Not only is Peg making a difference in the animal world, Peg is also a true asset to Bonanzle. We are very fortunate to have her as a Member. Thank you for all that you do to help the members of The Bonanzle Community. You go above and beyond to do all that you can for other’s. I wish you all the best and much success too! Here is a seller who offers wonderful items at great prices, and ships at the speed of light & with great care. Above and beyond that, Peg is extremely personable, and is always willing to help others on this site. Buy here with 100% confidence! Folks, you don’t know me from Adam, but I can tell you this, I’m honest in what I say. And I say that Peggi Sue is a real gem. One of a kind. Running her booth to help take care of her “Orphans” is a heart felt cause for her. When you purchase from her booth, you’re helping those little critters who wouldn’t normally have a chance. So come on now, take a look at Shelby and Fletch and the rest of them, and know that you’re doing something good. Something right. Peggi is the BEST! A real asset not only to Bonanzle, but to all of us. We could all learn something from her. I cannot recommend her highly enough. And comin’ from me, that’s saying somethin’! A very kind and helpful person! Highly recommend her! What can you say about someone who selflessly helps you while you’re struggling with your first Bonanza? Peg is an absolute breath of fresh air. She offered to help me without asking for anything in return. But now I can. I highly recommend this seller for any transaction. She’s good people. Trust her. A Bonanzle member that gives so much of herself to help others and Bonanzle grow…You can be sure any business you do with PegsPlace will be handled with extra care and attention… I highly recommend. Peggi Sue delivers sold items with speed and accuracy. She does volunteer work for homeless animals. She is on the site frequently and all business is executed with cheerful Southern goodwill and goodmanners. Wonderful Seller with super fast service. Excellent communication and an all around terrific person! I give Pegsplace my Highest Recommendation ~ you won’t be disappointed! crusade to help animals. I’m honored to call her a friend. I look forward to a great business relationship with Peggi as well as a wonderful friendship, and I wish her well in all of her endevours! FAIR & FUN to deal with! Just got the trade in we did! Love it!!! THANKS SO MUCH!! Super Bonanzle Seller Highly Recommended !!! This Seller is TOP Notch in communication and making the transaction work! I highly recommend Peg’s Place to the whole Bonanzle Community – she is a REAL asset to our community. I look forward to doing MORE business with Peg’s Place in the future. AAA Plus!! !